The Reese Witherspoon of this cast, which settled in last week for a three-week run at Portland’s Keller Auditorium, is Alli Mauzey, who plays Glinda the good witch with the over-the-top bubblehead-blonde charm that turned Witherspoon’s Elle Woods into a box-office sensation. (Older generations might also be reminded of Judy Holliday in Born Yesterday.) Mauzey pulls off the dumb-like-a-fox bit with considerable style and humor, and with the sort of tight execution that, far from being strictly mechanical, wraps its arms around an audience and invites it in on the joke. By the end, when Glinda’s pulled it together and begun to grow up, Mauzey casts hints of a more formidable leading lady, Bernadette Peters. Glinda is the glamour role in Wicked, even though the story is about the evolution of Elphaba the “wicked” witch, and Mauzey’s playful performance brightens what can be a long slog through overwrought choral numbers, some less than sparkling music and – once again at the Keller – a dicey sound system, although it behaved considerably better than for Beauty and the Beast. 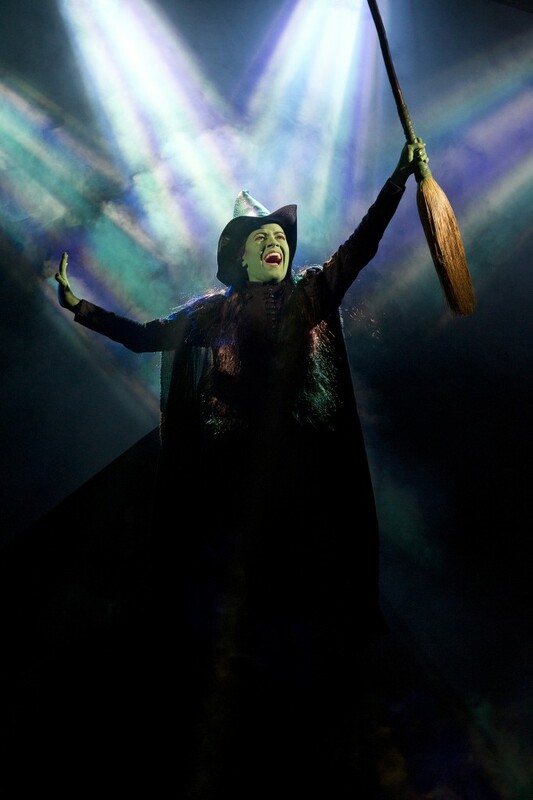 Elphaba, as the serious one (if your skin were green, you probably would be, too) is the show’s anchor, and as important as they are, anchors can be overlooked. Thankfully, Mamie Parris both acts and sings the role very well, getting inside the outsider’s skin and revealing her sensitivity and strength. She also does a nice job of capturing the dryly subversive humor that helps keep Elphaba from seeming like a moralizing pain in the posterior. Parris provides the shading that allows Mauzey’s Glinda to take flight without getting lost in the clouds: They’re an excellent match, each incomplete without the other. As Holly Johnson noted in her review for The Oregonian, this touring company is considerably better than the original one that hit town a few years ago, and if Mr. Scatter were to try to put his finger on exactly why he’d say because it’s so much more effective in the quiet parts. There’s a lot of sturm und drang in Stephen Schwartz’s American Idol-style score, and maybe perversely, it’s those great-big-grab-you-by-the-shoulders-and-shake-you moments that turn Mr. Scatter off. But a genuine human story is also going on, and where this production shines most brightly is in those important moments when key characters – Elphaba and Glinda, Elphaba and the ramshackle prince charming Fiyero (Andy Kelso), Elphaba and the sad goat-professor, Doctor Dillamond (Paul Slade Smith) – stop the parade and seriously engage one another. Do you get the sense that Elphaba is central to this story? In the end, Mr. Scatter still considers Wicked bloated and musically undistinguished. But this production helped him appreciate a lot of things about it he’d missed the first time around. Schwartz seems to share Andrew Lloyd Webber’s affection for historic musical and theatrical styles, if not his melodic skills, and the play has a pleasantly ramshackle pastiche quality beneath its overstatements. Mark Jacoby has one terrific old-fashioned song-and-dance scene as the Wizard; Liz McCartney is all Charles Ludlam cross-dressy as the frowsy Madame Morrible; Justin Brill bounces about in comic-sidekick fashion as the lovestruck Munchkin Boq. As new-style as Wicked purported to be when it premiered in 2003, its greatest charms are mostly Old Broadway. Bottom line: in the end, it’s still Wicked, and the cavernous Keller Auditorium remains a sadly wicked place to see musical theater: the louder things get, the more the sound system muddles them. But if you like Wicked (and zillions of people do) you could do far, far worse than this production. Mr. Scatter may not care much for the whole, but the parts have genuine charm. Besides, on the drive home the LLSB was happy and joking and humming those tunes and not worried in the slightest about pre-calc. And that was wicked good. * For newcomers, LLSB stands for Large Large Smelly Boy. He is the elder brother of the SLSB, or Small Large Smelly Boy. Both are now taller than their progenitors, but good nicknames die hard.